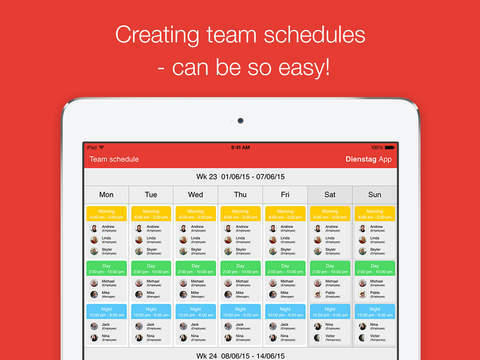 The primary purpose of Dienstag is to keep everyone on the same page when it comes to work scheduling. The best part about the app is that it’s not built specifically for managers or employees. It’s incredibly flexible and is perfect for anyone in pretty much any industry. To use Dienstag, all you need is a list of employees if you’re a manager, or your existing schedule if you’re an employee. The app takes a bit of customizing once you first open it, such as changing shift times. One of the things I really like about the app is that it gives you total control over pretty much everything. To add employees to the schedule, simply tap on the employee you wish to add, tap the shift, and then tap the calendar to add them to a particular day. Though Dienstag is incredibly feature-rich and flexible, it does take a little bit of time to become acquainted with how to navigate it. This is time well spent, though, as it’s a fantastic app. If you’re wondering about sharing, Dienstag does support export and sharing features for schedules. Simply tap the eye icon at the bottom of the screen for an overview of the schedule. You can then choose from a variety of export options for sharing the image of the schedule. One feature I’d love to see is the ability to sync Dienstag with multiple devices via iCloud. I’m not sure how it would be done, but it’d be perfect for workplaces with multiple iPads and managers who want a quick and easy way to sync and edit schedules without worrying about exporting all the time. 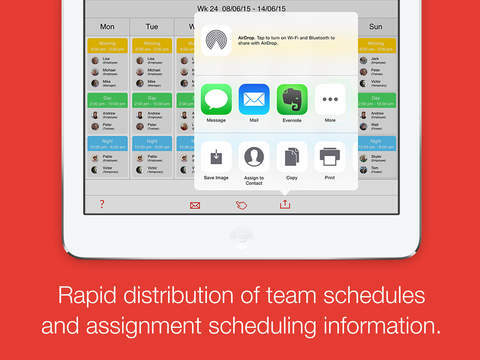 Overall, Dienstag is an incredibly powerful scheduling app for iPad that has tons of features for employees and managers alike. It offers plenty of flexibility for every work situation, and it can even be used outside of the workplace for activities like sports and coaching, teaching, and much more. The only sticking point is the price, which will likely make it the most expensive app you’ll purchase. I know it’s a big investment, and the value of the app completely depends on how much use you’ll get out of it. I definitely don’t recommend it as a casual scheduling app, but it’s worth every penny if you’re in charge of scheduling a large number of employees and need to do so efficiently. Hopefully a free or trial version can be released in the future so users can get a feel for Dienstag before they commit. Dienstag requires iOS 6.0 or later and is compatible with iPad.